It´s OH So Fresh , it´s OH so Funky..! 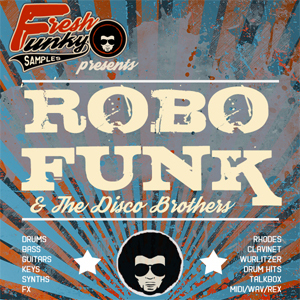 It´s the Fresh Funky Samples crew presenting RoboFunk & The Disco Brothers a super deluxe sample pack that will take your Breaks, Funk & Disco productions on a time travel journey to the future and to the past at the same time! Weird ? No , funkying awesome! RoboFunk & The Disco Brothers will inject 100´s of quirky cyberdisco nanobots into your sample arsenal bloodstream and strengthen your studio core with the juiciest and most funk-delight inducing set of samples you'll find in Earth , Outer Space or Beyond! This must have retro collection ( so retro that all sounds are heavy smoking and no one gives a dam ) includes over 530 dripping wet samples and loops that expertly mix the organic essence and swing of live studio session recordings played by top groovy-to-the-core musicians ( that history books will praise as The infamous Fresh Funky Disco Brothers ) with the futuristic vibes of analog synths and processed elements courtesy of Mr.RoboFunk.